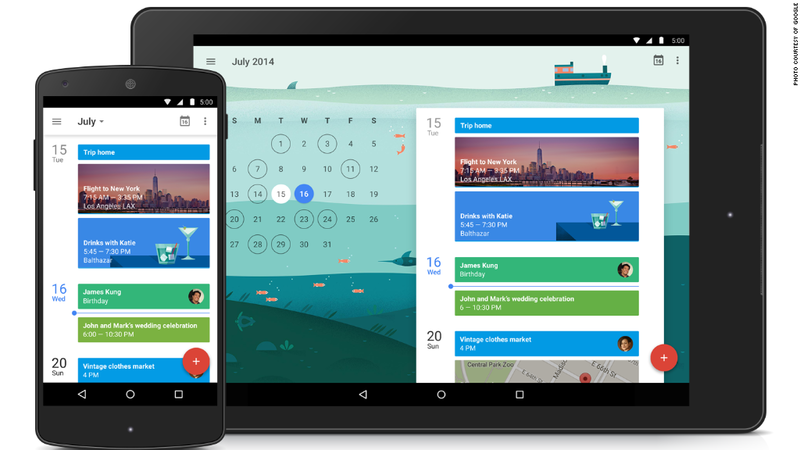 The new Google Calendar is now available for Android devices. Google Calendar is becoming more like a personal assistant. A new version of the popular calendar app is now available for users of the new Android Lollipop operating system, Google announced Monday. The biggest new feature is that the app can now scan your email and automatically create new events based on incoming messages. That means when you do things like buy concert tickets or book a flight, they'll show up right away on your calendar. The events will update on your calendar if you receive additional emails about them -- for example, a notification that your flight's been delayed. The new Calendar app will also make auto-complete suggestions based on previous events, and it automatically includes photos of where the event will take place. The app will work on all devices running Android 4.1 or later, with an update coming in the Google Play store within a few weeks. The company says it's still at work on a version for iPhone. Google (GOOGL) also recently released a new version of its Gmail mobile app, which now lets you manage accounts from alternative email providers. Lollipop, meanwhile, is available for a handful of new devices, and will become available more widely in the coming months as hardware makers incorporate it into their designs.